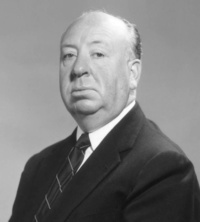 Sir Alfred Joseph Hitchcock, KBE (13 August 1899 " 29 April 1980) was an English film director and producer. He pioneered many techniques in the suspense and psychological thriller genres. After a successful career in British cinema in both silent films and early talkies, renowned as England's best director, Hitchcock moved to Hollywood in 1939 and became a U.S. citizen in 1955. Over a career spanning more than half a century, Hitchcock fashioned for himself a distinctive and recognisable directorial style. He pioneered the use of a camera made to move in a way that mimics a person's gaze, forcing viewers to engage in a form of voyeurism. He framed shots to maximise anxiety, fear, or empathy, and used innovative film editing. His stories often feature fugitives on the run from the law alongside "icy blonde" female characters. Many of Hitchcock's films have twist endings and thrilling plots featuring depictions of violence, murder, and crime. Many of the mysteries, however, are used as decoys or "MacGuffins" that serve the film's themes and the psychological examinations of the characters. Hitchcock's films also borrow many themes from psychoanalysis and feature strong sexual overtones. Through his cameo appearances in his own films, interviews, film trailers, and the television program Alfred Hitchcock Presents, he became a cultural icon. • Tippi Hedren details assault by Alfred Hitchcock: 'It was sexual, it was perverse." This webpage uses material from the Wikipedia article "Alfred_Hitchcock" and is licensed under the GNU Free Documentation License. Reality TV World is not responsible for any errors or omissions the Wikipedia article may contain.